Fairfield, Iowa: Where 'Art Belongs To Everyone' "Fairfield, Iowa is a thriving arts community more or less in the middle of nowhere," says resident Michael Halley. "In a small town of less than 10,000, we're busting at the seams with artists of all kinds: painters, sculptors, musicians, dancers, poets." This summer, NPR's Destination Art series went off the beaten path to visit small to mid-sized North American cities that have cultivated lively arts scenes. We asked you, our NPR audience, to tell us about your favorite art towns. Several visitors and residents wrote in to recommend Fairfield, Iowa. What's it like in Fairfield? Fairfield, Iowa, is a thriving arts community more or less in the middle of nowhere. 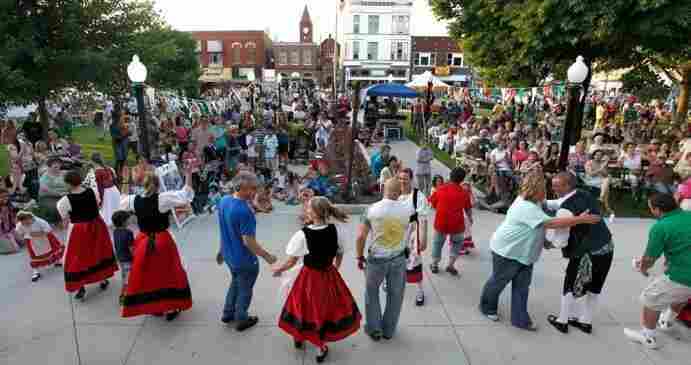 In a small town of less than 10,000, we're busting at the seams with artists of all kinds: painters, sculptors, musicians, dancers, poets. A perfect day in Fairfield? "Start with a cup of roasted-on-site coffee at Cafe Paradiso, and enjoy the floor-to-ceiling Lynn Durham mural while the barista tidies up from the world-class jazz concert held there the night before. Move out onto the square and enjoy the dozen summer art installations on the square, featuring different artists' concepts on the humble mailbox (previous years featured chairs, birdhouses and dress forms.) Then view some of the mosaic, painted and wood-carved murals dotting the walking alleys. "Enjoy a hike on our 17-mile Jefferson County Trail System that circles the town and see the NEA-funded art on a footbridge over the railroad tracks featuring ceramic tiles by high-school students depicting the century-old Loudon Machinery Co. .... Then enjoy lunch in one of our amazing artisan restaurants ... and soak in the painting exhibit on the walls. "That night, enjoy Fairfield 1st Fridays Art Walk — the first Friday of EVERY month of the year, rain, snow or shine, and featuring various themes — dance, film festival, sculpture, etc. — throughout the year. ... There will be a concert on the square and King Lear playing at the [Stephen] Sondheim [Center for the Performing Arts] that night as well as a dance troupe performing Indian dance at one of the many ballroom spaces in town.